Since getting my Silhouette Cameo, I have been more than a little intimidated by all the possibilities. I was very excited to try a couple different mediums, and so during my Buffalo trip, I purchased a vinyl starter kit (on sale from Jo-Anns). When I got home, I watched the instructional video and felt ready to go. Although the video was super helpful with how to use the machine, vinyl, and transfer papers to make your own designs, the one thing it forgot to explain was how to set up the machine before starting. I scoured the Internet to find instructions on how to set up the machine for vinyl, and decided that this topic warranted a blog post all of it’s own. First off, using vinyl instead of paper means that you don’t need to use the cropping mat. 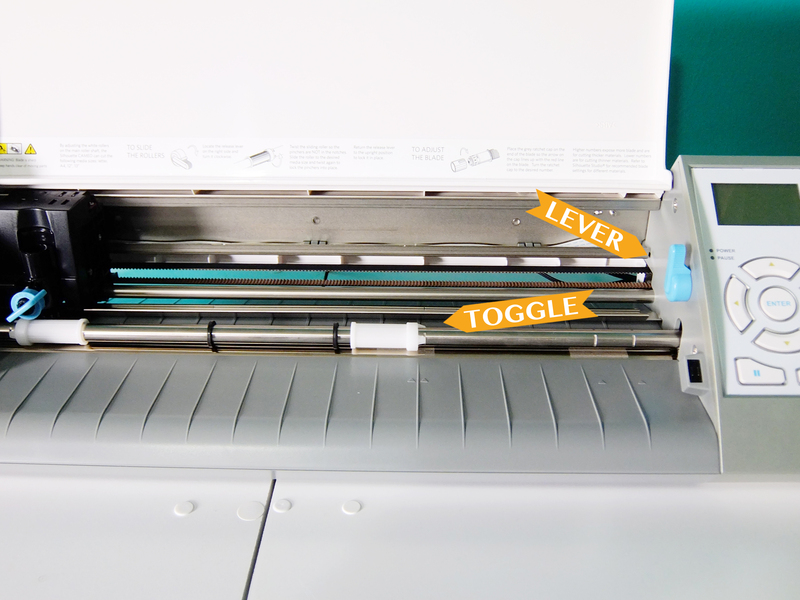 You can feed the vinyl directly into the machine, but before you do that, you need to change the settings of the white feeding toggles to adjust to the smaller size of the vinyl. If this is not done, your machine will have a hard time trying to feed the vinyl into the machine and won’t be able to cut properly. To do this, flip the blue lever to release the feed pole, turn the white toggle (it is a little hard at first if you have a new machine), and slide along the pole until it clicks into place in the smaller setting. If you’re not too sure where it should go, just use the groove marks on the pole for reference. Once this is securely in place, you will also need to choose the “Load Media” button, rather than “Load Cropping Mat” option. Remember to change the setting of the blade to 1 or 2, depending on the thickness of the medium. Now that your machine is ready to go, you will need to set up your Silhouette Studio computer program to align with this change. Go into the page settings by using the toolbar at the top of the page (the icon fourth-in from the right). Here, you will be able to change the width of the page from 12 (the default size) to 9 inches, which is the width of the Silhouette vinyl paper (if you’re using another type, put in your own measurements here). You should also switch the media type to Silhouette Vinyl when you go to send your image to be cut. The cut preview screen will also prompt you to change the blade size accordingly. These few steps are super easy (but super important) for when you’re switching between media types. Once you get the hang of this, you will be off to the races, cutting everything in sight! Let me know how it goes and what projects you create with your machines! 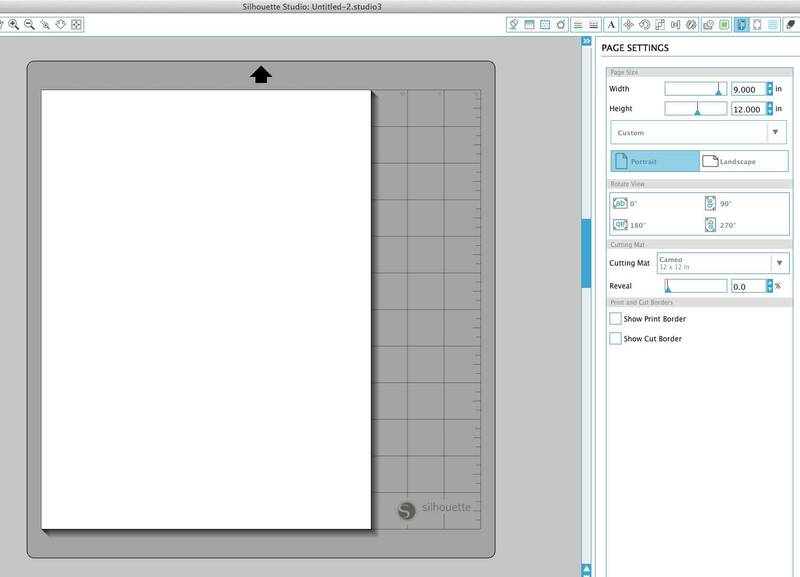 Please leave a comment below if you have any other tips or tricks for setting up your Silhouette for cutting vinyl. Keep your eyes peeled for some posts on my own vinyl projects coming soon!